I had an interesting conversation with Yo Zushi the other night about fashion in music production and mix. Middle Man, released in 1980, was recorded at the back end of 1979, using old-school analogue technology. By then, recording and mix engineers had had a few years to become familiar with the technology of 24-track analogue, learn how to compensate for the reduced track width caused by cramming that many tracks into two inches of tapes, discover ways to warm up the relatively sterile transistor-based desks that were now the rule rather than the exception, and begin to derive the benefits of new automation technology, which allowed for more precise mixing, particularly of vocals (automation allows you to program your fader moves in advance, rather than having to do them on the fly). So Middle Man, produced by Bill Schnee (who’d engineered Steely Dan’s Aja three years before) came out during a sort of period of grace. It was also a period where fashions were changing. The tight, dry West Coast sound of Middle Man was falling out of favour, especially in New York and in the UK: Jimmy Iovine (an East Coast guy through and through, even when he was working in LA) had already made Darkness on the Edge on Town (at the Record Plant New York) and Damn the Torpedoes (at Sound City in Van Nuys), and soon he’d apply that same absurd cannonball-hits-crash-mat drum sound to Stevie Nicks’s Bella Donna. In the UK, meanwhile, Hugh Padgham had stumbled across the gated reverb effect while recording Peter Gabriel’s third solo album. In 1981 Phil Collins would unleash his gated mega drums on In the Air Tonight and it would be all over for the Californian aesthetic. The same was true at the start of the 1990s. Sure, Matthew Sweet’s Girlfriend, with its startlingly bone-dry sound, may have pointed to the way things were going and acted as a necessary corrective to the never-ending decays on vocals and snare drums that were so prevalent at the arse end of the eighties. Sure, Bob Clearmountain’s mixes were coming back down to earth (by 1993 he’d be doing his best ever work on Crowded House’s Together Alone) after his big bam booming period mixing Hall & Oates, Huey Lewis and Bryan Adams. And sure Andy Wallace’s Nevermind mix was, despite its use of reverb samples, far drier than it could have been in someone else’s hands. But as late as 1993, Big Head Todd and the Monsters could have a platinum record with an album that deployed extremely prominent gated reverb on the drums* That’s to say nothing of Brendan O’Brien seemingly tracking Pearl Jam’s Ten in a cave**. At some point a trend gets overdone and a small vanguard starts going the other way to distinguish themselves from the herd. The question is, in our own era, who’s going to do it and what’s going to change? 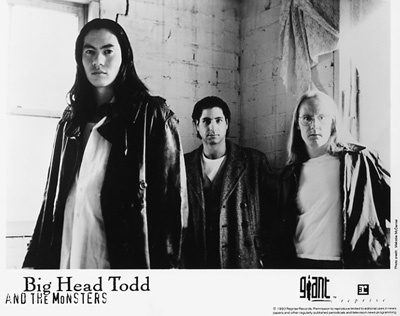 *If you’re not American – hell, if you weren’t living in the Mountain States in the early 1990s – you may not be aware of Big Head Todd and the Monsters. Let me assure you, then, that this was not a case of a behind-the-times band from the boondocks getting lucky: Sister Sweetly was produced and mixed by Prince sideman David Z at the Purple One’s own Paisley Park studio. The record, for whatever reason, just completely ignored the production trends of the preceding two years or so, and must have sounded almost laughably old-fashioned the moment it was released. Nonetheless it’s a decent record and it sold a million in the US. **The Pearl Jam guys disliked the mix enough that the 2009 re-release included a remix of the whole album. It’s noticeably drier. This entry was posted in Music and tagged 1970s, 1980s, 24-track recording, Aja, ambience, analogue, analogue-vs-digital, Andy Wallace, Audio Engineer, audio engineering, automation, Bella Donna, big bam boom, Bigg Head Todd & the Monsters, Bill Schnee, Bob Clearmountain, Boz Scaggs, Brendan O'Brien, Bruce Springsteen, Crowded House, Damn the Torpedoes, Darkness on the Edge Of Town, David Z, digital, fashion in mix, Girlfriend, If That's What it Takes, In the Air Tonight, Jimmy Iovine, Jojo, Matthew Sweet, Melt, Michael McDonald, Middle Man, mixing, mixing vocals, music production, Nevermind, Nirvana, Paisley Park, Pearl Jam, Peter Gabriel, Phil Collins, Prince, production, Record Plant, record production, recording, Silk Degrees, Sister Sweetly, Sound City, sound recording, Sound recording and reproduction, Steely Dan, Stevie Nicks, Ten, that eighties sound, that seventies sound, Together Alone, Tom Petty, west coast, Yo Zushi on September 4, 2015 by rossjpalmer.